Kids Free for Summer at Dreams Resorts & Spas! The hottest season of the year is here, and you know what that means — summer vacation! It’s the moment you’ve been waiting for, and if you’re planning a family vacation to celebrate, you’re in luck. We’re excited to share the details for our latest amazing deal at Dreams® Resorts & Spas! Read on to learn about the Kids Free for Summer offer at select Dreams Resorts. Grab your shades and sunscreen, this is one you definitely won’t want to miss! With Kids Free for Summer, two kids can stay, play and eat free at select Dreams Resorts! Vacation State of Mind at Dreams Resorts & Spas! Happy #TravelTuesday from Dreams® Resorts & Spas! The summer season may be winding down, but our state of mind is summer all year-round! Get in a Vacation State of Mind at Dreams Resorts! Discover the Magic of Dreams Las Mareas! If you’re looking to experience a majestic new destination with the whole family, we invite you to Discover Dreams Las Mareas! For a limited-time, guests can explore Dreams Las Mareas Costa Rica for a special rate that will have you ready to pack your bags! Dreams Las Mareas Costa Rica is the newest vibrant beach getaway for couples, families and singles to enjoy all the inclusions of an Unlimited-Luxury® escape in a privileged location. Located on an expansive palm-studded beach and surrounded by lush green mountains & jungles on Playa El Jobo in the Guanacaste region of Costa Rica, guests of all ages enjoy an action–packed vacation featuring watersports, land activities, and swimming pools while sunbathing or laying under a thatched palapa. Continue the fun into the evenings with live nightly entertainment, outdoor bars and lounges and so much more! 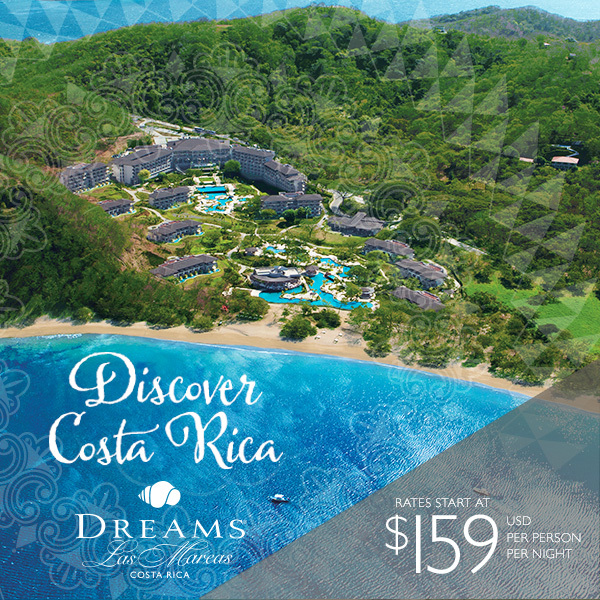 Discover Dreams Las Mareas Costa Rica! Three Ways to Win Big! Dreams Resorts & Spas recently launched the Triple Play promotion, which provides our guests with three ways to win – incredible savings, weekly upgrades and a chance to win a 7-night stay! Incredible Savings! From now until November 30, 2011 for travel through June 22, 2012, guests can save up to 40% off your Unlimited-Luxury® stay at any Dreams Resorts & Spas. Plus, you can bring up to two kids free and enjoy up to $400 in resort coupons to use towards spa treatments, fine wine and romantic dining. Book now. Weekly Upgrades! If you’ve already reserved your stay, enter for your chance to win a complimentary room upgrade. New winners are chosen each week. Upgrade now. Win the Grand Prize Drawing! Enter for your chance to win a 7-night Unlimited-Luxury® stay for two at the resort of your choice. Enter now. Visit AMResortsTriplePlay.com for more details. The grand prize winner will be selected on December 6, 2011. Terms and conditions apply.